Each bloom is paired with an intention, because we could all use a little guidance as we go through life. We like to start every morning in a field of wildflowers, clearing our mind and setting an intention for the day. 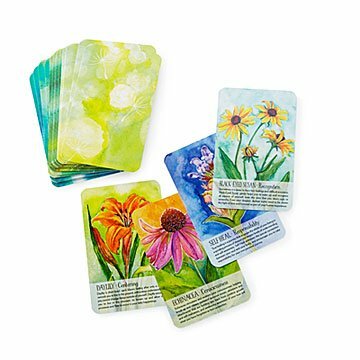 Lisa Estabrook knows just how inspiring a little of nature's beauty can be (and that we all don't have a field of wildflowers handy) so she took two years to create this colorful deck of cards. Each features an illustration by Lisa of a flower from her gardens, and the woods around her home in Maine. Then, she paired the 44 blooms with different intentions—white pine and wisdom, iris and inspiration—with the idea that we could all use a little guidance as we go through life. The deck also includes two cards with practice suggestions and information about the flowers. Made in Maine. I pick a card a day and try to find the flower to combine the full beauty of the cards intention.